Solenoid valves are used in irrigation systems to regulate the water supply to the various groups of the installation. Indirect solenoid valves are best suited for this application. Indirect operated solenoid valves are suitable for high flow rates, but they need a pressure differential of typically 0.5 bars to open. Applications with a low inlet pressure, such as a gravity fed system with a water tank, are not suited for indirect operated valves. 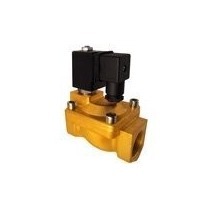 For these systems, a semi-direct operated solenoid valve or electric ball valve is better suited. Unlike ball valves, solenoid valves are susceptible to dirt and can be used only with clean (tap) water. Rain Bird solenoid valves are most commonly used for irrigation, but these are only available in 24-volt alternating current. This page provides an overview of alternative universal solenoid valves.